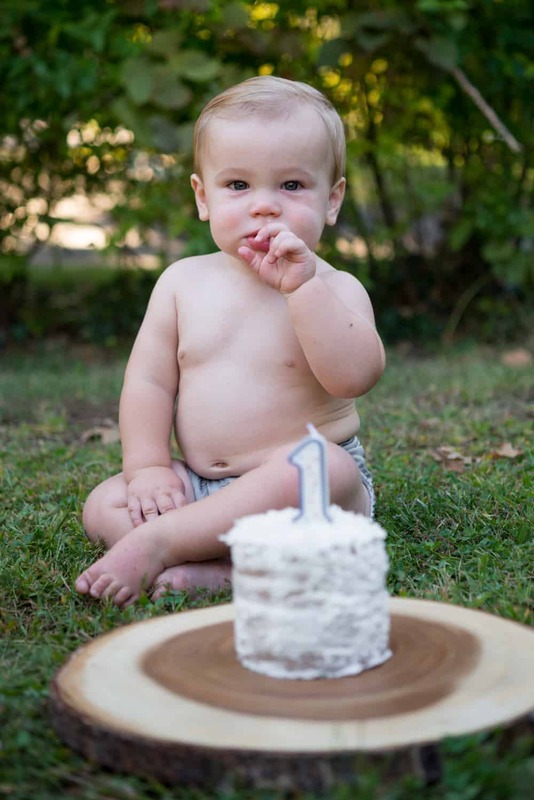 And just like that, my sweet baby is 1. Fellow parents, I know you know how monumental this occasion feels. It’s hard to explain the mix of emotions that happen when you realize that your baby has been your baby for 365 rotations of the earth. Van’s still my baby, but he’s quickly moving on to toddlerhood. So, we celebrated. 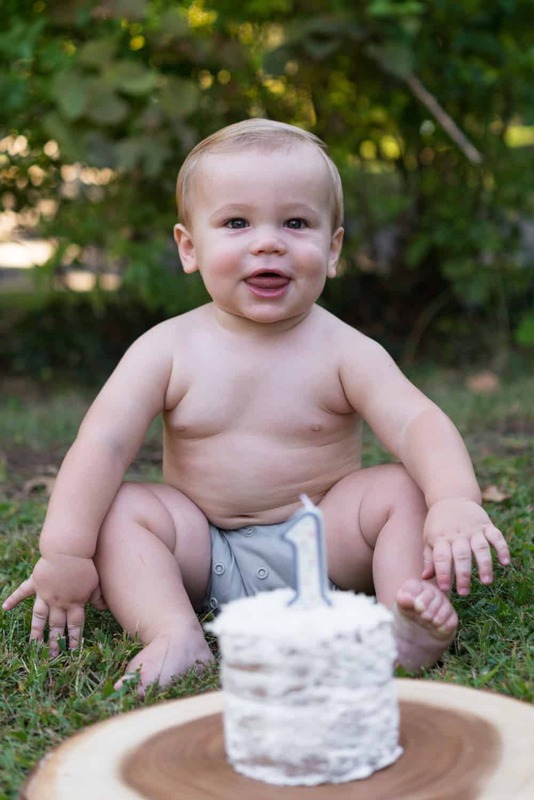 We celebrated his first birthday and, just as importantly, the milestone as parents. The first year is rough. Motherhood has been complicated, messy and filled with self-doubt, but more importantly, the most joyous, peaceful and gratifying path I’ve ever walked. All of the cliche’s are true; it really is the most incredible kind of of love. We hosted a big party in celebration this weekend at a local park. Our friends and parents showed up to eat, play and watch this guy eat some cake. 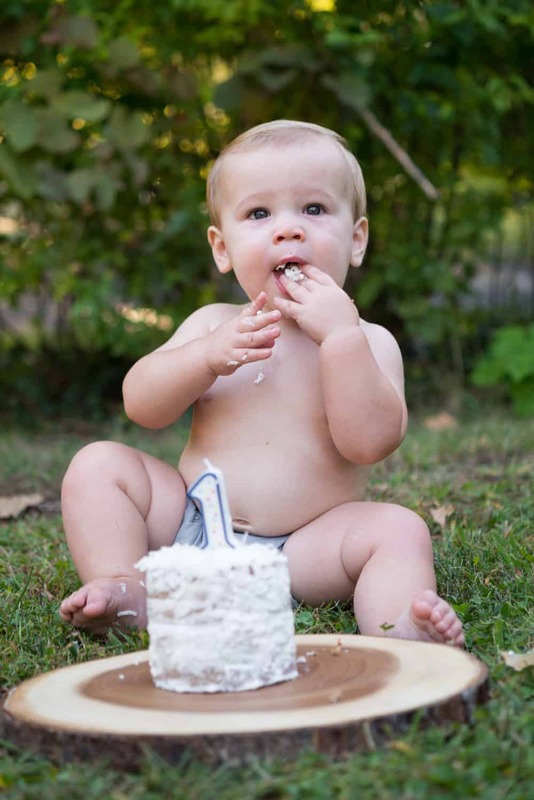 Of course, it’s hard to have a first birthday party without a cake to celebrate! This vegan smash cake is perfect for those of you who want the experience of doing a smash cake without having one that’s loaded with sugar, butter and artificial colors. I went back and forth for a trying to decide if I was going to make a healthy cake or just a regular one and ultimately decided to do a healthy one. Why? Well, for starters, Vander doesn’t know any different. I’m sure he would have loved a ‘regular’ cake but since he’s none the wiser, I didn’t feel like I needed to introduce sugar to him here. Additionally I knew with all of the festivities, he was going to be stimulated enough. Therefore, I didn’t want to give him a ton of sugar on top of that. Let me also preface this by saying that removing sugar from baked goods alters the texture and flavor. 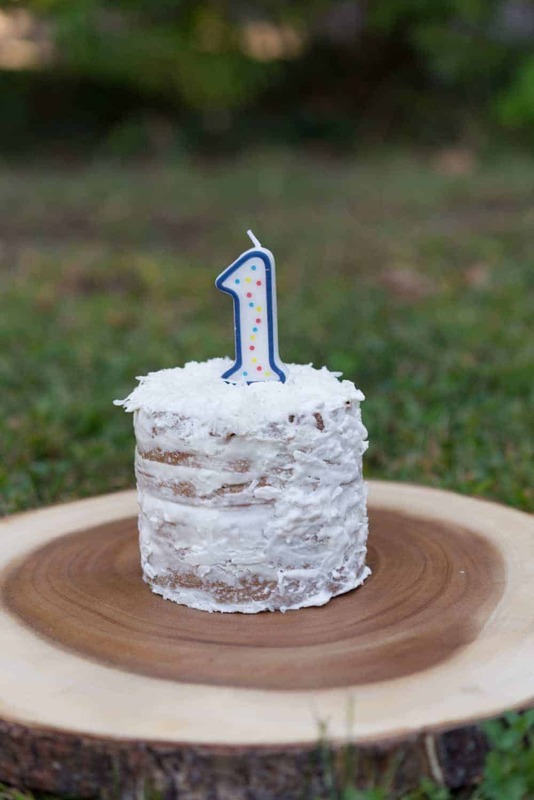 This cake is great and perfect for a 1st birthday smash, but it is dense and not sweet- even with using the banana and applesauce. So don’t expect fluffy white cake from the grocery store, because it’s not that. You can add more sugar if you want a sweeter/lighter cake but since this was a first birthday cake, I decided to only use 2 tablespoons of the maple syrup for balance. 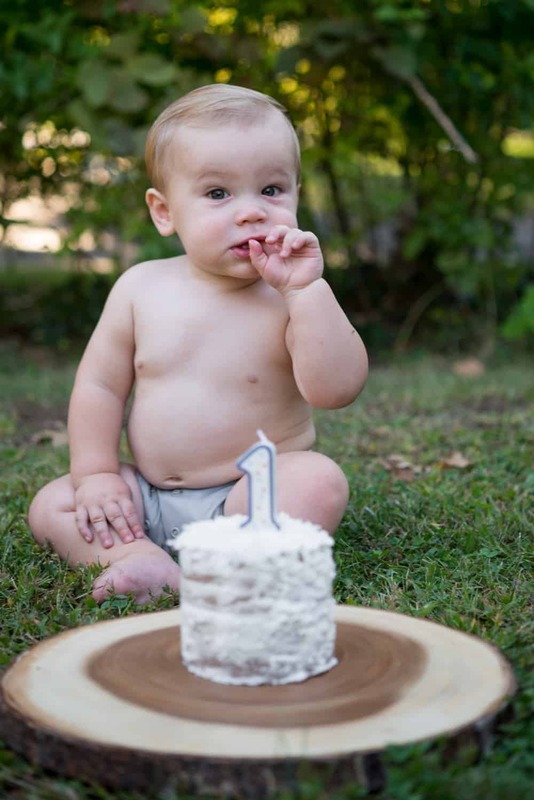 As you can tell by these photos, he loved this cake! It took him a moment to figure out that he could eat it, but then the fun began. 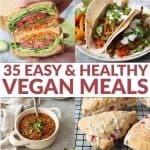 Healthy Vegan Smash Cake! If you’re looking for a naturally sweetened, healthy vegan smash cake THIS IS IT! 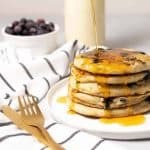 Made with flax, bananas, applesauce and frosted with a sugar-free coconut frosting. Perfect for a 1st birthday party! Whisk together all of the dry ingredients in a large bowl: flour, baking soda/powder, pie spice and salt. In a blender, puree together banana, applesauce, milk, combined flax + water, maple syrup and vanilla. You can combine by hand, but I find that a blender makes the banana creamier and easier to mix into the cake. Add the wet ingredients to the dry and mix until just combined, taking care not to overmix. Lightly spray and flour two 4″ cake pans (or an 8″ cake pan, or cupcakes.) Divide batter and cook for 20-22 minutes until a toothpick inserted comes out clean. Remove and set on a cooling rack for 10 minutes; then remove from pan and cool completely. Add the cream of tarter to the bowl and beat until fluffy and able to hold stiff peaks; this may take ~8 minutes. Place in the fridge until ready to frost. Assemble the cake! I sliced the tops off the cakes to make them flat, then sliced the cakes in half to create 4 layers. You can also just do two layers. Add a dollop of the frosting to the top of the cakes, spread out in an even layer, then add the other cake on top. Add the coconut whip to the rest of the cake and frost. Then, gently adhere shredded coconut to the top/sides, if desired. Eat! You can freeze the cake ahead of time after baking. Wrap in plastic wrap and freeze, then thaw completely before frosting. The frosting can be made a day ahead of time, kept in the fridge. Awww, Happy Birthday Vander!! What a sweetie. He is so darn cute, Alex! Our baby’s name is Vander!! I was searching for a healthy smash cake for his first birthday (2/10) and thought Google was getting super creepy when I saw the link “healthy smash cake for vander’s 1st birthday”. Ha! And it the perfect recipe! Can’t wait to try this. Any tips on converting it to a 10.5oz ramekin? No way!! We’ve never met another Vander 🙂 So happy that you’ve stumbled upon this page. I haven’t tried it in a ramekin, I would just watch for baking time. It’s pretty dense since it’s healthy and doesn’t have any real sugar to leaven it, once it is cooked through all the way- it’s done! Happy Birthday Vander! I had come across this a bit sooner. You have inspired me to try this recipe. Thanks for a great recipe that will be put to good use for my son.